But the most important focus this week is the integration between all VMware products and 3th party products like InfoBlox and Service Now. The lab environment consists of virtualized ESXi hosts and is using NSX for the networking part. In NSX there is some bug (or should I say undocumented feature ;-)) that cause lots of packet drops when using virtualized ESXi hosts and NSX. The solution to work around is to create DRS rules to keep some of the VMs (the ones you are working on) together on a virtualized ESXi host so all network traffic is kept locally. I think it’s also possible you experience the same slow connection if you are doing the VMware Hands On Labs because the setup is probably the same. Today when booting up my lab again I had the issue that the infrastructure tab had a strange name. The name was changed in: com.vmware.csp.component.iaas.proxy.provider@csp.places.iaas.label instead of just Infrastructure. All underlying tabs had the same problems. If you know where to click everything is still working, but it doesn’t feel good. Rebooting from step 3 will resolve this issue. First shutdown all services in the reverse order and when you are at the vRealize appliance 1 just reboot this one. Wait till the VAMI is showing up in the console and then (and not earlier!) start the next one of the list. If the server is a Windows server give it some extra time to boot up all services. If everything is restarted then you will see the normally names and tabs. The last couple of weeks I’ve been doing research on the VMware vCloud Air for one of our customers. Our customers is looking at the vCloud Air solution for large pieces of their current infrastructure, and the big driver for this investigation is the fact that at first looks the prices for VMware vCloud Air look cheaper (way cheaper accually) in stead of building and migrating and their own Datacenters. But to get a clearer view of what the VMware vCloud Air , let’s dive in to vCloud Air to see if this is true and what vCloud Air is. For this part we’re going to take a look at the Dedicated Cloud offering and we’re diving in to the benefits and positive points of the solution. Welcome in the buzzword bingo? There is to much buzzwords going around in this area that it is hard to keep track on what is what! What is the difference betweens private cloud, Infrastructure as a Service and Dedicated cloud and on-premises infrastructure? What does it mean for your company and where does fit in your IT environment? For me the Invisible IT buzzwords is what most companies (I do business with) are really looking for…. Providing the IT resources instantly when the business needs it, and thereby being a business enabler is what IT should be all about. In the the last couple of decades it often happened that when the business needed a new application to help the business growth, it could take months before the application could be used. With the birth, and adoption of virtualization most IT departments managed to cut this down to about a week. But that time is used to just implement the virtual servers needed for the application (with the right network and storage resources), and after this time the application still needs to implement and test the the application. With the introduction of cloud a lot of people were sceptic. But after a couple of years people use it all the time, and got used to the benefits of cloud computing. One of the biggest advantages of cloud computing is how fast it is to buy resources. Go to AWS, Azure, Google or whatever cloud providor you want and with a credit card and a few clicks your VM is running in minutes…. This is where most IT departments lost the battle (they think…). If a in house department still needs to wait weeks of even still months before they can really start developing, implementing and using the application they tend to run, and use, the public cloud quickly. They normally won’t think of the business impact of such a move, but on the other the project can deliver much quicker and that’s all that counts to them. As Dilbert explained in the comic above there is a way for IT to use the on-premises resources as well as the public cloud to move be the business enabler IT needs to be. It seems such a long time ago that virtualization needed to prove its place in the Datacenter. A lot of companies looked at the virtualization product and didn’t see it production ready, but after testing it in their test environments and seeing the benefits almost all companies testing also started using it in their production environments as well. The same is seems to happen with the use of hybrid cloud, but it seems that the hybrid cloud adoption goes much faster. The way companies start using a hybrid cloud solution is lots of time driven by the fact that certain workloads already started their development in the public cloud, and the company would like to embed the posibilities the cloud provides. 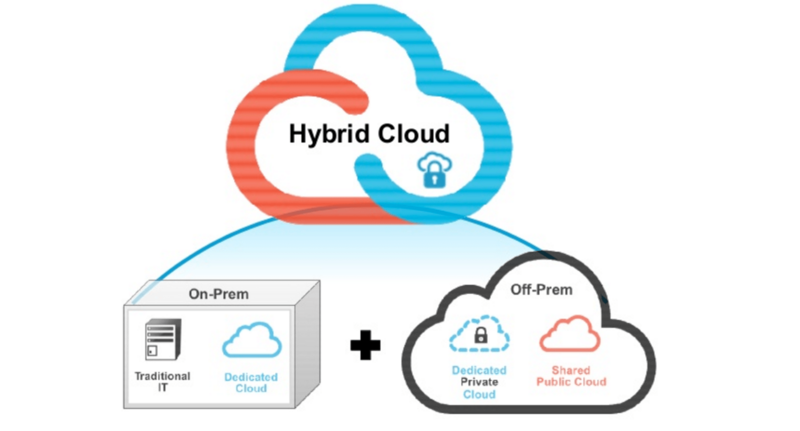 The Hybrid cloud is the combination of private (which could also be a traditional IT environment) and public cloud(s) which provides your company the best of both worlds. But to manage these clous, you’ll need the right tools. I started this post about the VMware vCloud Air solution, but in the end I didn’t really talk about it that much. 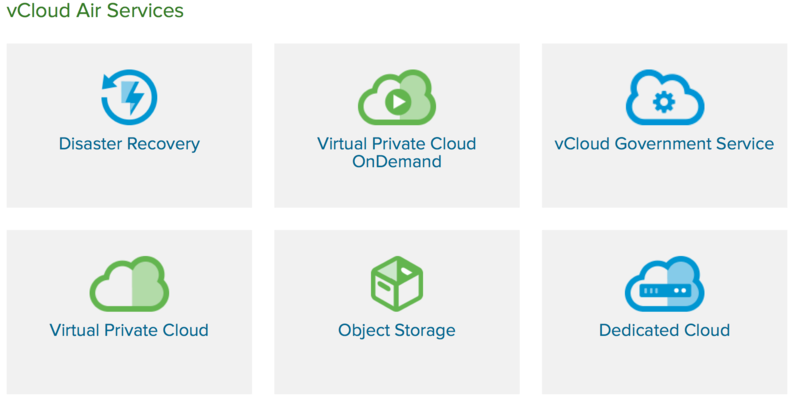 I promise I’ll do more in depth in the next part but for now I want to focus a little more on VMware vRealize Suite and the vCloud Air products for building a VMware Hybrid cloud. 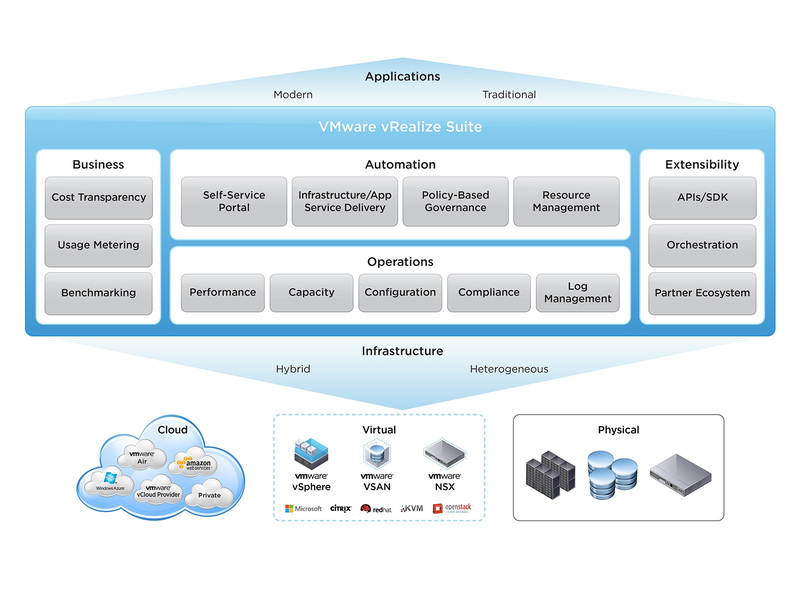 With a lot of companies that build their virtualization environment on the VMware vSphere product, it is an easy step to want to build their hybrid IT environment on this foundation. To do so, they can leverage the vRealize suite product to automate and orchestrate their current environment as well as the vCloud air solutions, and furthermore other cloud solutions like AWS, Azure and others. For a lot of companies this would build the environment they need to be on the edge, while still maintaining a soltution build on the foundation they already had, keeping the knowledge they already have in house, and giving IT the power to become a business enabler again. When I started this post I didn’t intend it to be this long, and that’s the main reason to stop puting more information in this single post. Where I started out with an introduction to VMware vCloud Air, it became much more, but that’s what blogging is all about (IMHO :D) I’ll be back with more information on vCloud Air, vRealize suite, CMP, and more…. But for now cheerio! If you want to know more about this topic, I’ll be presenting at next TECHunplugged conference in London on 12/5/16. A one day event focused on cloud computing and IT infrastructure with an innovative formula combines a group of independent, insightful and well-recognized bloggers with disruptive technology vendors and end users who manage rich technology environments. Join us!